A peasant was walking with me. He had a healthy soul that he had been able to maintain, with all its purity and simplicity. I love pure souls and I take pleasure in penetrating them, so I listened closely to his conversation and only interrupted to ask questions. There was no breeze through the trees, nobody was on the road and the majestic silence ruled the starry night. All of a sudden we heard the galloping of a horse. “Someone is coming.” I told my partner to put in practice his country man’s ear. I hadn’t got the words from my mouth, when suddenly the galloping stopped. A few moments later the galloping started again, but wasn’t rhythmical like last time, there was something strange about it. It seemed to me as if a smile appeared on the lips of the man as if my ignorance amused him. We were very near our destination and the dogs could smell us. They started barking, not menacingly, but in a friendly welcoming way. The stars lit up the night and it seemed like one of those fantastical landscapes you see only in books. “No soul has remained the same after seeing “La Cegua”. Strong men, healthy, happy, joyous, hard working men, have change completely. Some even die out of fright.” Then he began to name a list of a few people he knew that has lost their life to this terrible apparition. “Is it possible that she can be seen by two?” I asked. “Only when we are by ourselves she approaches us– he replied happily, because he knew I had been listening with a lot of interest. “In some places out of the town’s limits, where there are a lot of bushes and trees along road, is the usual spot where she likes to surprise the passing riders. 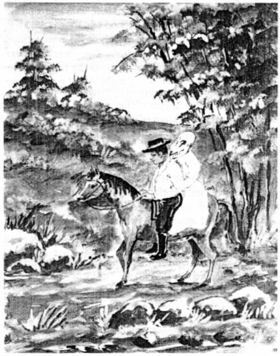 She appears in the middle of the road, and with a very sweet and weak voice she says: “Kind Sir, I’m very tired, and I’m on my way to see my sick mother, would you be kind enough to give me a lift to…” And she gives the name of the nearest town, because she is the devil itself and knows everything”. “Then, it is a person, or has a person’s characteristics?”, I dared to ask again. At that moment a gentle breeze started to make the leaves move that created shadows all around and then brushed the path ahead of us, as if some invisible mischievous force was moving ahead of us. Mother Nature was helping the narrator create the effect he wanted. We arrived to the gate and I could hear the dogs barking louder. Meanwhile, I was in deep meditation. Is there no other healthy way to teach this fantasy? Who has not encountered “La Cegua”? Who has not surrendered to the seduction of a beauty and its physical charms and nothing more? Who hasn’t surrendered to the misunderstanding mercy? And then, the weakness of the body, the soul, and perhaps death? So, “La Cegua” is a story used to scare young men into doing the right thing and keeping their minds pure.